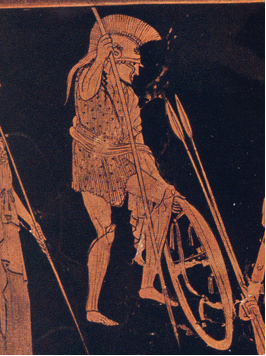 This image, from the Niobid Painter’s name vase, may be of the “heroes of Marathon” and is as likely Aristides as any other picture. Son of Lysimachus, lived roughly 525 – 468 BC, known later in life as “The Just.” Perhaps best known as one of the commanders at Marathon. Usually sided with the Aristocratic party. Aristides was a byword for honour and integrity, and Plutarch’s comparison of Aristides to Cato seems to say everything that needs to be said. It is worth saying that the Demos and the Aristocratic factions of ancient Athens cannot be linked, even philosophically, to modern politics. First, it is essential to understand that the Demos—the party of the people—often supported Tyranny, as the best way of oppressing the aristocrats. Second, that the aristocrats themselves were scarcely united—Marxist notions of class are truly anachronistic here. Class strife had to do with some very different perceptions of what was in the best interest of the state—rather like the modern clash between “big” business and “small” business over issues like border controls, NAFTA, and taxation. By our standards, everyone involved in both “factions” were men of property and real wealth. When all the base labour of a society is done by slaves, and when everyone accepts slavery as an institution, there is no Socialist Workers party. Although Aristides is often labeled an aristocrat and even an oligarch, his plain spoken contempt for lies and deceit make him, to me , a sort of “Mr. Smith goes to Athens” figure in the politics of the day.